You can directly reload the card with your credit cards at Target stores. This was very appealing. I thought it would help my manufactured spending. And there is no monthly fee. So, I just bought it without simulating a usage of this card. I tried to come up with a method for manufacture spending, but it seems AmEx for Target is not for those who are collecting cash back or travel reward. Because the fee is inevitable. Online, you can load the card from your bank account, and there is no fee. However, if you want to load with your credit or debit cards, you will need to go to Target store and have them swiped. They charge $3 fee. The amount of each load is from $0.01 to $1,000. If your credit card has a great reward program, it may be worth it, but when you take money out of the card, they also charge a fee. You can withdraw up to $400 per week. The first withdrawal in each calendar month is free, and later $3 fee per withdrawal. This fee is charged by AmEx. The ATM owner fee is charged on every withdrawal. The website says the maximum withdrawal is $400, but the paper included the package says $200 max. I don’t know why. It may be because of the place I live or buy. But, it doesn’t matter $200 or $400, every withdrawal cost and reduce the value of the reward points you earned when loading the card with a credit card. Unlike American Express Serve, the card can’t sync with Amex offers. I expected some special features when you shopped at Target with the card, but there is nothing. It is just Target sells the cards and reload them. That’s it. 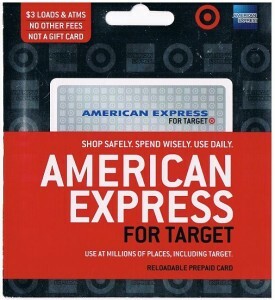 AmEx for Target may be good for those who want to use it in a plain way, meaning that simply you don’t want to carry cash, or parents want to control and watch their children’s spending, etc. But it’s not recommended to people who don’t have a bank account. No fee when you load the card online from your bank account, but whether you load the card with cash or check, you have to go to Target and pay $3 fee per load. As long as you use the card on purchases at stores or online, there is no fee. Loading from your bank account and spending at stores or online charge no fee, and there is no monthly fee, either. American Express for Target is a great item for those who use it in a simple way, but it can’t be used for manufactured spending.